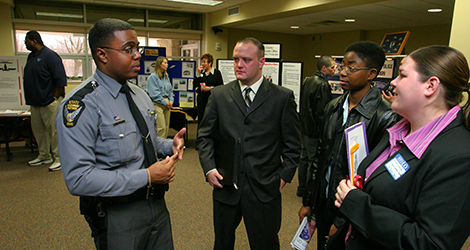 Criminal justice is a great choice of degree for those who want options when they graduate. You won’t be forced into a specific industry, rather, you will have the opportunity to use your skills in a wide range of different fields. Online criminal justice program tuition can be expensive, but it is more than worth the investment if you chose to peruse any of these exceptionally rewarding careers. Your in-depth knowledge of the law would make you well suited to a job in government, helping to set new laws. As crime evolves, and criminals use new technology and methods, the law needs to change to enable it to continue to protect people in the best way possible. A graduate of a criminal justice degree would have all the skills required for this kind of job. Law enforcement and investigation comes in many forms. From police officers, to security guards and private detectives, all of these careers and more in the law enforcement sector would be available to you. Police officers work not only in crime prevention and the capture of criminals, but also in education, educating the general population about crime, and on the ways to keep themselves and their homes safe. Everyone that works in a courtroom, or law office, requires an understanding of the law, as well as history of law and appropriate punishments. Another court job could include becoming a court bailiff. Jobs in forensics include forensic investigator, as well as more specialist fields such as a blood splatter analyst. While many of these jobs require further science based education or training, a criminal justice degree could open many doors. Once crimes have been committed, criminals need to be punished and rehabilitated. Then, laws need to be looked at to try to prevent these crimes from happening again. Jobs in corrections are ideally suited for those with criminal justice degrees. Correctional officers can work at local, state and federal levels, mainly in prisons. In most states, the focus has shifted from guarding prisoners to rehabilitating them, ensuring they can lead a productive life upon their release. Using your skills and knowledge of crime and the law to help victims can be a great vocation. Unfortunately, the victims of crime can often be overlooked. You could work with support groups or hostels to help victims understand what has happened to them, perhaps even taking on further training to become a counselor. Other options involve working as a victim advocate for the police force, government or healthcare services. Other options might include working for homeland security or border control. Basically, you could turn your skills to any field that involves law or justice. A criminal justice degree pretty much guarantees you a career full of excitement and variation, but you’ll always have options for change when you want it. If you are more interested in crime, what causes it, and how it can be prevented, consider looking into online criminology degree tuition this year.